ABSTRACT. The 12-lipoxygenase (12-LO) pathway of arachidonic acid metabolism is implicated in extracellular matrix (ECM) synthesis, but its role in podocytes has not been studied. This study tested whether 12-LO induction by diabetes or by high glucose (HG) in cultured podocytes alters glomerular basement membrane by activating signal transduction pathways culminating in ECM synthesis. Sprague-Dawley rats received an injection of diluent (control [C]) or streptozotocin 65 mg/kg (DM) and were killed at 1 or 4 mo. Glomerular 12-LO mRNA and protein levels were higher in DM than in C glomeruli at 1 and 4 mo, and 12-LO localized predominantly in podocytes. Glomerular p38 mRNA and protein were higher in DM at months 1 and 4, but phospho-p38 mitogen-activated protein (MAPK) was increased only at month 1. Glomerular collagen α5(IV)/glutaraldehyde-3-phosphate dehydrogenase (GAPDH) mRNA ratio was increased in DM at month 1 but not at month 4, whereas collagen α5(IV) protein was higher at both 1 and 4 mo. Mouse podocytes were cultured in media with 25 mM glucose (HG) with or without the 12-LO inhibitor cinnamyl-3,4-dihydroxy-cyanocinnamate (CDC) or with 5.5 mM glucose + 19.5 mM mannitol (low glucose [LG+M]) for 10 d at 37°C. 12-LO mRNA and protein levels were higher in HG than in LG+M as was the p38 MAPK/GAPDH mRNA ratio. Phospho-p38 MAPK protein but not total p38 MAPK was higher in HG compared with LG+M. Collagen α5(IV)/GAPDH mRNA ratio and protein were higher in HG than in LG+M. 12-LO inhibition by CDC decreased HG-induced phospho-p38 MAPK and the phospho-p38/total p38 MAPK ratio, collagen α5(IV)/GAPDH mRNA ratio, and collagen α5(IV) protein expression. In summary, diabetes in vivo and exposure of podocytes to HG in vitro stimulated 12-LO, p38 MAPK, and collagen α5(IV) mRNA and (activated) protein. 12-LO inhibition by CDC diminished the expression of podocyte phospho-p38 MAPK and collagen α5(IV) mRNA and protein. These findings implicate 12-LO and the p38 MAPK signaling pathway in the mediation of ECM synthesis by podocytes in diabetes. Albuminuria is a cardinal feature of diabetic nephropathy, and the glomerular capillary wall is its structural determinant. Traditionally, albuminuria has been attributed to loss of size-selective and/or charge-selective properties of the glomerular basement membrane (GBM). Podocytes may contribute to maintaining glomerular permselectivity by (1) synthesizing the subepithelial portion of the extracellular matrix (ECM) of the GBM, (2) adhering to GBM via the α3 β1integrin, and (3) covering the GBM with interdigitating foot processes maintained by a cytoskeleton and linked by a filtration slit membrane. By inducing changes in these podocyte properties and functions, podocyte injury or activation may contribute to proteinuria in diabetic nephropathy. The 12-lipoxygenase (12-LO) pathway of arachidonic acid metabolism has been shown to mediate some actions of angiotensin II, including hypertrophy, and ECM synthesis in numerous cell types, including mesangial cells and smooth muscle cells (1–3⇓⇓). It is also upregulated in these cells by in vitro exposure to media of high glucose content (1,3⇓). We previously showed that upregulation of the 12-LO pathway in vivo in diabetic glomeruli is accompanied by early increments in the activation and expression of p38 mitogen-activated protein kinase (MAPK) signaling components and in the elaboration of the nuclear transcription factor cAMP response element binding protein (CREB) and of fibronectin at the mRNA and protein levels (3,4⇓). In addition, we demonstrated an increase in 12-LO and fibronectin mRNA and protein in glucose-stimulated mesangial cells (3). The findings of high glucose (HG)-induced p38 MAPK signaling in diabetic glomeruli and in cultured mesangial cells have also been reported by others (5–7⇓⇓). In reviewing our in vivo studies assessing activity of the 12-LO pathway in diabetic rats, immunohistochemical examination of the renal tissue sections suggested that the 12-LO pathway was activated in podocytes in addition to mesangial cells (3). To investigate the potential contribution of podocyte dysfunction to the development of diabetic nephropathy, we tested whether 12-LO induction either by diabetes in vivo or by HG in cultured podocytes in vitro contributes to alterations in the GBM in association with the activation of the p38 MAPK signal transduction pathway. In the current study, 12-LO, p38 MAPK, and podocyte-specific collagen α5(IV) mRNA and protein levels were measured in the glomeruli of rats with streptozotocin (STZ)-induced diabetes and in conditionally immortalized cultured mouse podocytes. The specific role of 12-LO in mediating podocyte collagen α5(IV) protein synthesis was tested using the 12-LO inhibitor cinnamyl-3,4-dihydroxy-cyanocinnamate (CDC) in vitro. CDC has previously been shown to be a relatively specific inhibitor of the 12-LO pathway (8). Male Sprague-Dawley rats (220 to 250 g) received an injection of either diluent (control [C]; n = 24) or STZ 65 mg/kg intraperitoneally (DM; n = 30). Diabetes was confirmed by tail-vein blood glucose levels on the third day after injection. Blood glucose (glucometer), 24-h urinary albumin (ELISA Nephrat II; Exocell, Inc., Philadelphia, PA), body weight, and kidney weights were measured before the rats were killed at 4 mo after injection. Rats were killed at 1 and 4 mo after injection. Microdissected glomeruli were used to measure 12-LO, p38 MAPK, and control glutaraldehyde-3-phosphate dehydrogenase (GAPDH) mRNA by reverse transcription–PCR (RT-PCR) as described previously (3,4⇓), whereas sieved glomeruli were used to measure collagen α5(IV) mRNA. Glomerular protein measurements (12-LO, p38 MAPK, phospho-p38 MAPK, and collagen α5(IV)) were performed on sieved glomeruli by Western analysis (3,4⇓). Microdissected and sieved glomeruli were stored at −70°C before use. Separate rats were raised for the RT-PCR and the Western analyses. Portions of kidney were saved for immunohistochemical and light microscopic studies. Conditionally immortalized mouse podocytes were cultured as described by Mundel et al. (9). Briefly, frozen podocytes were first grown under permissive conditions at 33°C in RPMI 1640 media containing 10% FBS, 50 U/ml γ-IFN, and 100 U/ml penicillin/streptomycin/amphotericin (Fungizone, BRL, Grand Island, NY) in collagen-coated flasks, and the γ-IFN was tapered down to 10 U/ml in successive passages. Cells were then trypsinized and subcultured without γ-IFN (nonpermissive conditions) and allowed to differentiate at 37°C with media changed on alternate days. Differentiation of podocytes grown for at least 8 d at 37°C was confirmed by the identification of the podocyte differentiation marker synaptopodin by Western blotting (data not shown). After subculture from an undifferentiated population of mouse podocytes incubated at 33°C (9), incubation proceeded at 37°C for 8 d in standard RPMI (glucose 200 mg/dl) with 10% FCS and 100 U/ml Fungizone to establish the differentiated state. For assessing the effect of HG on 12-LO, the p38 MAPK signaling pathway, and collagen α5(IV) mRNA and protein synthesis, for the next 10 d, the glucose content of the RPMI media was substituted as follows: (1) HG (25 mM glucose) or (2) low glucose + mannitol (LG+M; 5.5 mM glucose + 19.5 mM mannitol to achieve iso-osmolarity). During the last 2 d of the 10-d incubation period, cells were exposed to the above conditions but with 0.4% FCS and 0.2% BSA for 24 h, followed by another 24 h with 0.2% BSA only. Cells were then harvested for either RNA or protein (see below). For testing the mechanistic importance of the 12-LO pathway in stimulating HG-induced phospho-p38 MAPK activity and collagen α5(IV) mRNA and protein, total and phospho-p38 MAPK expression and collagen α5(IV) mRNA and protein were compared in podocytes incubated in HG alone versus those incubated in HG plus the 12-LO inhibitor CDC (25 mM glucose + 10 μM CDC). CDC was added fresh to media three times weekly on alternate days. lactate dehydrogenase release was measured as per Stambaugh and Post (10) to assess cell viability during 3 consecutive days of incubation with CDC. Total RNA from either microdissected glomeruli or cultured podocytes was isolated using RNA-STAT-60 reagent according to the manufacturer’s protocol (Tel-Test, Inc., Friendswood, TX). One microgram of total RNA was used for first-strand cDNA synthesis as described previously (3,4⇓). Glomerular 12-LO mRNA was measured by a nested PCR, and podocyte 12-LO mRNA was measured by a nested competitive PCR as described previously (3). Glomerular p38 MAPK mRNA was measured by competitive PCR as described previously (4). Collagen α5(IV) and p38 MAPK isoform mRNA were measured by conventional PCR. Primers for mouse p38 α MAPK were as follows: (S) 5′-CGTTGTTTCCTGGTACAGACC-3′ and (AS) 5′-CCATTTCTTCTTGGTCAAGGG-3′; p38 β (S) 5′-GCTGAAGCCAATCATGGAGG-3′ and (AS) 5′-GCTCAATTTCATGGGTGCCAG-3′; p38 γ (S) 5′-CCTCCTGAGTTTGTTCAGAAGC-3′ and (AS) 5′-CCTTTTCCAGAGAAGGGAAGC-3′; and p38 δ (S) 5′-GGCTCACCCCTTCTTTGAACC-3′ and (AS) 5′-GCATGCCTTTAATCCCACCACC-3′. Primers for collagen α5(IV) were as follows: (S) 5′-ATGCTGACTAGCAACCATGA-3′ and (AS) 5′-GCCAGATCACATCTAAATGA-3′. PCR products were visualized on 2% agarose gels, and band density was measured using National Institutes of Health image software. Standard PCR assays were normalized to GAPDH mRNA band densities, and the data are expressed as the ratio of the two. Competitive PCR measurements were expressed as a ratio of the wild-type divided by the mutant band densities. Sieved glomeruli and podocytes harvested from tissue culture dishes were lysed in SDS sample buffer (2% SDS, 10 mM Tris-HCl [pH 6.8], 10% [vol/vol] glycerol), sonicated, and centrifuged at 10,000 × g for 10 min at 4°C, and the supernatant stored at −70°C until used. Protein concentration was determined with a Bio-Rad kit (Bio-Rad Laboratories, Hercules, CA). Fifty micrograms of boiled extracts was applied on 10 to 12.5% SDS-PAGE gels and transferred to polyvinylidene fluoride membranes (Bio-Rad Laboratories). For collagen α5(IV), a 4 to 15% gradient gel was used. A rabbit polyclonal antibody to a specific leukocyte 12-LO peptide with sequence homology to amino acids 39 to 55 of porcine leukocyte 12-LO was used as described previously (3). Total and phospho-p38 MAPK were determined using polyclonal antibodies (Cellsignalling Technologies, Santa Cruz, CA) as per the manufacturer’s protocol. mAb (mAb 7 clone) is directed against an epitope on the NC1 domain of human collagen α5(IV) (11,12⇓). A 1:10 dilution of this antibody was used, and the blots were incubated overnight at 4°C. For routine light microscopy, coronal slices of kidney were placed into alcoholic Bouin’s solution and processed in the standard manner, and sections were stained with periodic acid-Schiff (13). A diabetic nephropathy score was calculated for each specimen based on a 0 to 4+ semiquantitative measure of glomerular changes including mesangial widening, segmental glomerulosclerosis, insudative lesions, and capsular drops. All glomeruli in each section were examined. For 12-LO immunohistochemical staining, kidney tissue was fixed in 10% neutral-buffered formalin and embedded in paraffin. Five-micron sections were deparaffinized, hydrated in ethyl alcohol, and washed in water. Antigen retrieval was carried out in 10 mM sodium citrate buffer for 20 min using a Black and Decker vegetable steamer. For 12-LO staining, a polyclonal rabbit anti-porcine 12-LO antibody (DAKO, Carpinteria, CA) diluted at 1:300 with 2% casein in BSA was applied overnight at room temperature, the sections were washed, and a secondary swine anti-rabbit antibody was added for 20 min. Slides were then washed and incubated with a tertiary rabbit-PAP complex for 20 min. Diaminobenzidine was added for 7 min, and slides were counterstained with hematoxylin. 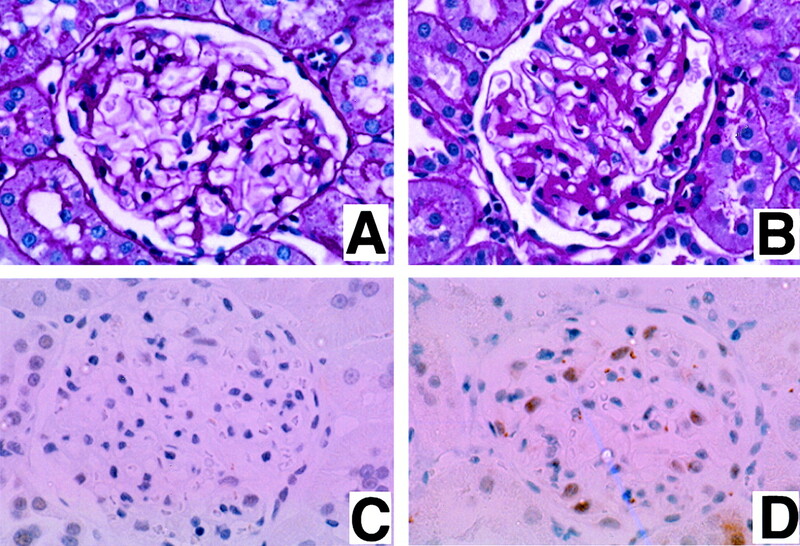 Glomerular podocytes were identified by routine morphology and were evaluated for 12-LO staining. The degree of staining was semiquantified on a scale of 0 to 4+. All glomeruli in each section were examined, and a staining score was obtained by multiplying the intensity of podocyte staining by the percentage of glomeruli staining for that intensity; these numbers were then added for each experimental animal to give the staining score: Σ (intensity of staining) × (% of glomeruli with that intensity) = staining score. Results are expressed as the mean ± SEM. Statistical analysis was performed using the statistical package SPSS for Windows Version 7.51 (SPSS, Inc., Chicago, IL). Results were analyzed using t test or χ2 analysis where appropriate. Significance is assigned at the P < 0.05 level. Physiologic parameters were obtained in the rats that were killed at 4 mo, and their tissues were used for RT-PCR and immunohistochemical analyses. The blood glucose level in the C group was 102 ± 5 mg/dl and in DM was 415 ± 34 mg/dl (P < 0.01). Urinary albumin excretion in the C group was 4.59 ± 1.42 mg/d and in DM was 22.08 ± 4.94 (P < 0.01). Body weight increased in both groups but increased more in C (632 ± 15 g) than in DM (367 ± 10 g; P < 0.01). Kidney/body weight ratio was lower in C (0.36 ± 0.01 g) than in DM (0.87 ± 0.04 g; P < 0.01). The 12-LO/GAPDH mRNA ratio in DM glomeruli was 6.1-fold higher than in C at 1 mo (DM, 0.43 ± 0.05; C, 0.07 ± 0.007; P = 0.001) and 2.4-fold higher than C at 4 mo (DM, 0.48 ± 0.04; C, 0.20 ± 0.06; P = 0.003; Figure 1A). The p38 MAPK wild-type/mutant mRNA ratio was significantly higher at 1 mo (DM, 1.48 ± 0.2; C, 0.87 ± 0.15; P < 0.05) and 4 mo (DM, 1.21 ± 0.15; C, 0.78 ± 0.09; P < 0.05) in DM glomeruli compared with C (Figure 1B). The glomerular collagen α5(IV)/GAPDH mRNA ratio was higher in DM (1.66 ± 0.08) than in C rats (1.18 ± 0.07) at 1 mo (P < 0.003) but not at 4 mo (DM, 1.14 ± 0.07 versus C, 1.12 ± 0.07; Figure 1C). GAPDH mRNA was not different in DM and C rats (Figure 1A). Figure 1. Glomerular 12-lipoxygenase (12-LO), p38 mitogen-activated protein kinase (MAPK), collagen α5(IV), and glutaraldehyde-3-phosphate dehydrogenase (GAPDH) mRNA levels in rats with diabetes for 1 and 4 mo. (A) mRNA values demonstrating increased 12-LO/GAPDH in diabetic (DM) rats and a representative gel showing the reverse transcription–PCR (RT-PCR) products. (B) mRNA values showing increased p38 MAPK wild-type/mutant ratio in DM at 1 and 4 mo and a gel showing representative RT-PCR products. Each lane represents a competitive RT-PCR reaction of 40 cycles using RNA from the microdissected glomeruli of control (C) or DM rats of 1 mo or 4 mo duration. Each reaction was performed with a fixed amount of p38 MAPK wild-type cDNA (476 bp) from the equivalent of 0.2 glomeruli from each rat and a fixed amount of p38 MAPK competitor cDNA (355 bp). The data are expressed as the ratio of wild-type to competitor optical densities measured by densitometric analysis. (C) mRNA values for collagen α5(IV) and a representative gel showing the RT-PCR product showing increased collagen α5(IV) mRNA in DM rats at 1 but not at 4 mo. Lanes 1 to 4 are from C rats; lanes 5 to 8 are from DM rats. *P ≤ 0.05; **P ≤ 0.01, DM versus C.
Densitometric quantification of Western blots revealed a 2.3-fold increment in 12-LO protein expression in DM (2285.6 ± 209.8 densitometric units [U]) compared with C rats (1015.3 ± 180.7 U) at 1 mo (P < 0.05) and a 2.8-fold increase in DM (2217.5 ± 139.1 U) compared with C rats (725.3 ± 114.2 U) at 4 mo (P < 0.001; Figure 2A). Total p38 MAPK protein levels were significantly increased in DM compared with C rats at both 1 mo (DM, 11,848.9 ± 2,649.5 U; C, 4,250.6 ± 2,912.3 U; P < 0.05) and 4 mo (DM, 11,327.8 ± 1,957.9 U; C, 3,368.0 ± 1,802.1 U; P < 0.01). However, phospho-p38 MAPK, representing p38 MAPK activity, was greater in DM (24,828.4 ± 1,756.9 U) than in C (3,144.7 ± 1,425.5 U) at 1 mo (P < 0.001) but not at 4 mo (none detected in either group; P > 0.05; Figure 2B). Expression of collagen α5(IV) protein was determined using antihuman mAb 7 directed against the NC1 domain of human collagen α5(IV). Western blotting revealed a major band at 190 kd most likely representing intracellular collagen monomer, consistent with findings reported by other investigators (14), along with multiple minor bands of smaller molecular weight, including bands ranging from 50 to 123 kd. Glomerular collagen α5(IV) protein expression, quantified by densitometry of the 190-kd major band, was increased approximately fourfold at 1 mo, but the small number of samples (C, n = 3; DM, n = 2) did not permit a statistical comparison (Figure 2C, left). At 4 mo, there was a significant increase in glomerular collagen α5(IV) in the DM compared with the C rats (optical density readings, 0.82 ± 0.08 versus 0.52 ± 0.05; P < 0.01; Figure 2C, right). GAPDH protein was not significantly different in C and DM rats (Figure 2C). Figure 2. Glomerular 12-LO, p38 MAPK, and collagen α5(IV) protein levels in rats with diabetes for 1 and 4 mo. (A) Values for 12-LO protein and a representative immunoblot showing increased glomerular 12-LO at both 1 and 4 mo in the DM rats; std, standard. (B) Values for p38 MAPK and phospho-p38 MAPK proteins in DM and C rats at 1 and 4 mo. Total p38 MAPK was increased at both 1 and 4 mo. Phospho-p38 MAPK protein was increased in diabetic glomeruli after 1 mo of diabetes but not after 4 mo. (C) Increased collagen α5(IV) protein in the glomeruli of DM rats compared with little or none demonstrable in C rats at 1 mo (left). The bar graph lacks error bars because of the small number (C, n = 3; DM, n = 2). Lanes 1 and 2 are from C rat glomeruli, and lanes 4 and 5 are from DM rat glomeruli. Increased collagen α5(IV) protein in the glomeruli of DM rats compared with that in C rats at 4 mo (right). Lanes 1 to 4 are from C rat glomeruli, and lanes 5 to 8 are from diabetic rat glomeruli. *P ≤ 0.05; **P ≤ 0.01; ***P ≤ 0.001, DM versus C.
The DM group had diffuse expansion of mesangial regions with occasional glomerular segmental sclerosis and insudates and infrequent capsular drops resulting in a diabetic nephropathy score in the DM group (1.17 ± 0.13) that was significantly higher than in the C group (0.21 ± 0.10; P < 0.001; Figure 3, A and B). Immunohistochemical staining for 12-LO in glomeruli was detected in both mesangial cells and podocytes, with a clear predominance in the latter (Figure 3, C and D). The semiquantitative staining scoring for 12-LO was higher in DM (94.6 ± 15.9) than in C rats (28.8 ± 7.8; P < 0.01). Patchy 12-LO staining was also detected in tubular epithelial cells within proximal and distal tubules and in the deep medulla but at a frequency and an intensity that were not significantly different in the DM and C rats (data not shown). Figure 3. Light microscopic changes and 12-LO immunohistochemistry in the C and DM rats. (A) Representative glomerulus from the C group. Mesangial regions are normal in width. (B) Representative glomerulus from the DM group. Mesangial regions are expanded with periodic acid-Schiff (PAS)-positive material without hypercellularity. (C) There is no staining of any cells for 12-LO. (D) There are 12-LO–positive cells with the location and appearance of visceral epithelial cells. Magnifications: ×260 in A and B (PAS), ×260 in C and D (12-LO). Podocyte 12-LO mRNA measured by competitive PCR and expressed as wild-type/mutant ratio was approximately twofold higher in podocytes exposed to HG (1.95 ± 0.17) than in those exposed to LG+M (0.84 ± 0.04; P < 0.05) (Figure 4A). The p38 α but not β, γ, or δ MAPK/GAPDH mRNA ratio was higher in podocytes cultured in HG (0.72 ± 0.18) than in LG+M (0.47 ± 0.10; P = 0.013; Figure 4B). A significant increment in the collagen α5(IV)/GAPDH mRNA ratio was also observed in podocytes exposed to HG compared with LG+M (HG, 0.46 ± 0.02; LG+M, 0.25 ± 0.06; P < 0.05; Figure 4C). GAPDH mRNA was not significantly different under the two culture conditions (Figure 4C). Figure 4. Podocytes incubated in high glucose (HG) show increased 12-LO/GAPDH, p38 αMAPK, and collagen α5(IV)/GAPDH mRNA compared with culture in low glucose + mannitol (LG+M). (A) Graphic representation and scanned gels showing increased 12-LO mRNA in HG versus LG+M. Each lane represents a nested compet-itive RT-PCR reaction from podocytes incubated in LG+M (5.5 and 19.5 mM, respectively; lanes 1 to 4) or HG (25 nM; lanes 5 to 8). Each reaction was performed with a fixed amount of 12-LO wild-type cDNA (368 bp) and a fixed amount of 12-LO mutant competitor cDNA (Mu, 248 bp). The data are expressed as the ratio of wild-type to competitor optical densities measured by densitometric analysis. (B) p38 α, β, γ, and δ/GAPDH mRNA from podocytes incubated for 10 d in HG versus LG+M. There was an increase in p38 αMAPK (P < 0.05) in HG but not in p38 β, γ, or δ MAPK. (C) Increased collagen α5(IV)/GAPDH mRNA from podocytes incubated in HG versus LG+M for 10 d. *P ≤ 0.05; HG versus LG+M. There were significant differences in the expression of 12-LO, phospho-p38 MAPK, the phospho-p38 MAPK/total p38 MAPK ratio, and collagen α5(IV) proteins in podocytes exposed to HG compared with those exposed to LG+M. 12-LO was higher in podocytes incubated in HG (119.7 ± 7.0) than in LG+M (78.1 ± 2.1; P = 0.01; Figure 5A). Figure 5. Podocytes incubated in HG show increased 12-LO, p38 MAPK, phospho-p38 MAPK, collagen α5(IV), and GAPDH protein compared with culture in LG+M. 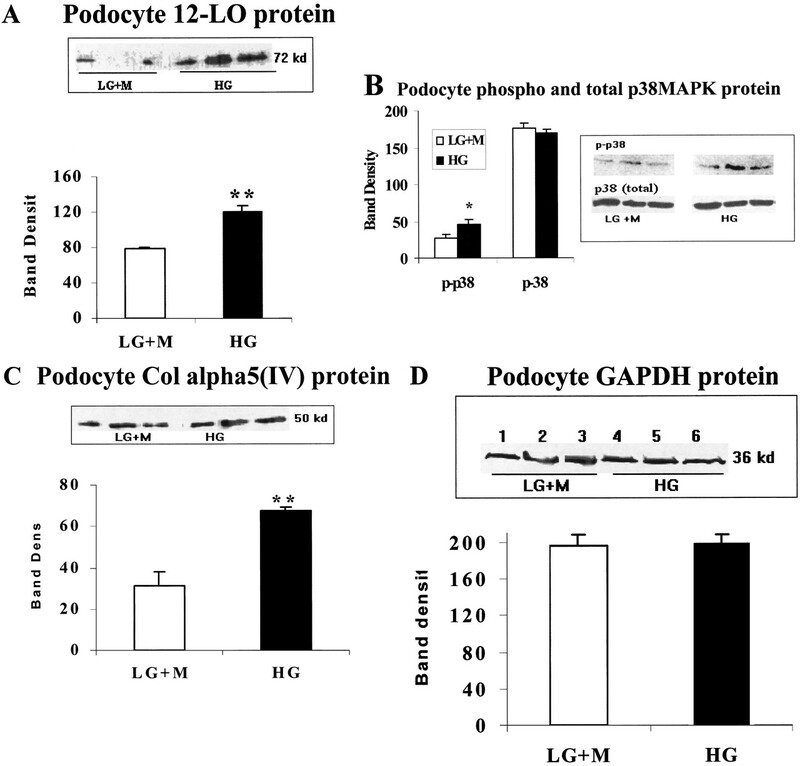 12-LO, p38 MAPK, phospho-p38 MAPK, collagen α5(IV), and GAPDH protein of podocytes incubated for 10 d in HG versus LG+M. (A) 12-LO protein from podocytes incubated in HG (lanes 4 to 6) was higher than that from podocytes incubated in LG+M (lanes 1 to 3). (B) Total p38 MAPK was not different in the HG versus LG+M cultures. Phospho-p38 MAPK was higher in HG versus LG+M. (C) Collagen α5(IV) protein was higher in cultures incubated in HG (right three lanes) compared with those cultured in LG+M (left three lanes). (D) There was no difference in the GAPDH protein in lanes 1 to 3 from podocytes incubated in LG+M and lanes 4 to 6 from podocytes incubated in HG. *P ≤ 0.05, **P ≤ 0.01, HG versus LG+M. Phospho-p38 MAPK was also higher in HG (45.2 ± 4.3) than in LG+M (26.5 ± 6.3; P < 0.05; Figure 5B), as was the phospho-p38/total p38 MAPK ratio. Total p38 MAPK did not differ (HG, 170 ± 5 versus LG+M, 176 ± 6.3). Collagen α5(IV) protein was higher in HG than in LG+M (P < 0.01; Figure 5C). The major band for collagen α5(IV) protein was found at 50 kd. Podocyte GAPDH protein did not differ significantly in the two groups (Figure 5D). Incubation with the 12-LO inhibitor CDC reduced both the phospho-p38 MAPK level and the phospho-p38/total p38 MAPK ratio (P < 0.05; Figure 6A). CDC also reduced the collagen α5(IV)/GAPDH mRNA ratio (HG, 0.46 ± 0.02; HG+CDC, 0.24 ± 0.05; P < 0.05; Figure 6B) and reduced the podocyte collagen α5(IV) protein expression in HG versus HG+CDC (P < 0.01; Figure 6C). There was no difference in either GAPDH mRNA (data not shown) or protein in the HG compared with HG+CDC cells (Figure 6D). Lactate dehydrogenase release was monitored daily for 3 d, and there was no significant difference between the podocytes incubated in HG versus HG+CDC (data not shown). Figure 6. The 12-LO inhibitor cinnamyl-3,4-dihydroxy-cyanocinnamate (CDC) decreased HG-induced podocyte collagen α5(IV) mRNA and protein expression and phospho-p38 MAPK protein. (A) Inhibition of phospho-p38 MAPK protein without a significant change in total p38 MAPK protein in podocytes cultured in HG+CDC compared with those incubated in HG for 10 d. (B) Inhibition of collagen α5(IV) mRNA expression in podocytes cultured in HG+CDC compared with those cultured in HG for 10 d. GAPDH mRNA was not significantly different. (C) Inhibition of collagen α5(IV) protein in podocytes cultured in HG+CDC compared with those cultured in HG for 10 d. (D) No difference in GAPDH protein from podocytes cultured in HG versus HG+CDC for 10 d; *P ≤ 0.05; **P ≤ 0.01, HG versus HG+CDC. The 12-LO pathway plays a key role in mediating the actions of effector molecules such as angiotensin II, glucose, and PDGF in vascular smooth muscle cells (1,15,16⇓⇓). Previous work from our laboratory demonstrated that 12-LO mRNA and protein are also induced in mesangial cells by incubation in media of HG content and in the glomeruli of rats with STZ-induced diabetes at the mRNA and protein levels (3). In mesangial cells, 12-LO mediated, at least in part, angiotensin II–induced mesangial cell hypertrophy and the elaboration of fibronectin (2). The current study demonstrates that diabetes and HG increase podocyte 12-LO, activation of the p38 MAPK pathway, and collagen α5(IV) accumulation. Inhibition of the 12-LO pathway with the 12-LO inhibitor CDC resulted in a decrement in activation of the p38 MAPK pathway and in collagen α5(IV) mRNA and protein expression. These studies implicate podocyte 12-LO in the activation of p38 MAPK and collagen α5(IV) mRNA and protein in experimental diabetic nephropathy. Increments in podocyte collagen α5(IV) mRNA and protein in response to HG media have been reported previously (17). However, the mechanisms responsible for these increments were not discerned, as TGF-β was not implicated. To our knowledge, this is the first work to elucidate the activation of an intracellular signaling pathway leading to collagen α5(IV) mRNA and protein synthesis in podocytes induced by increased glucose concentration. Podocytes play an important role in the synthesis and maintenance of the subepithelial GBM and in the maintenance of glomerular permselectivity. Numerous in vitro studies in other cells suggest potential pathways by which 12-LO activation might stimulate podocytes. Arachidonic acid and its metabolites have been shown to stimulate MAPK activity in vascular smooth muscle cells (18), and the 12-LO product 12-HETE has been shown to induce sustained activation of MAPK, including c-Jun N-amino terminal kinase (JNK) and p38 MAPK (2,19–21⇓⇓⇓). Thus, LO products and other arachidonic acid metabolites have been shown to mediate the actions of growth factors via activation of immediate early genes and their upstream signaling kinases. Furthermore, LO activation has been shown to lead to oxidant stress by the generation of superoxide (22). 12-HETE, angiotensin II, and a high ambient glucose concentration have been shown to stimulate fibronectin synthesis in vascular smooth muscle cells (1,16⇓), and our previously published data demonstrated that angiotensin II functions similarly in mesangial cells via p38 MAPK (2). Finally, LO inhibitors have been shown to block angiotensin II–induced hypertrophy in vascular smooth muscle and in glomerular mesangial cells (2,16⇓). Thus, ample evidence suggests that the 12-LO pathway may contribute to podocyte pathology in diabetic nephropathy through numerous mechanistic pathways involving the mediation of the activities of cytokines and growth factors by stimulating downstream immediate early genes and key signaling kinase molecules. In these studies, glomerular p38 MAPK mRNA was increased early (1 mo) and later (4 mo) during the course of induced diabetes. However, activated phospho-p38 protein was increased only at the early time point and not at the later time point. The MAPK family includes the p44/p42 or ERK1/2 MAPK (23,24⇓), which are primarily responsive to growth and mitogenic signals, JNK/MAPK (2,25,26⇓⇓), and p38 MAPK, which are usually responsive to stress signals such as osmolality changes, ultraviolet light, oxidants, and cytokines (2,27,28⇓⇓). They integrate signals from several receptors and, by phosphorylation of key transcription factors, can regulate gene expression (2,23,29⇓⇓). Recent studies in vascular smooth muscle and mesangial cells by us and by others have shown that HG can lead to the activation of ERK, JNK, and p38 MAPK (2,30,31⇓⇓). MAPK (ERK1/2) and p38 MAPK have been reported to be activated in the glomeruli of diabetic rats and in mesangial cells cultured in HG (2,5–7⇓⇓⇓). Studies also support the role of these MAPK in angiotensin II action in vascular smooth muscle and mesangial cells and in fibroblasts (2,19,32⇓⇓). Recently, p38 MAPK has evoked interest because it can lead to the activation of several growth and stress-related transcription factors (2,23,29,33–35⇓⇓⇓⇓⇓) such as AP-1, Elk-1, ATF-2, and CREB (2,23,29⇓⇓), with the potential for the transactivation of key ECM genes (36). In the current studies, there was early activation of glomerular p38 MAPK mRNA and phospho-protein associated with a concomitant increment in glomerular collagen α5(IV) mRNA. The subsequent decrement in activated glomerular phospho-p38 MAPK protein was associated with a decline in glomerular collagen α5(IV) mRNA levels and evidence of accumulated collagen α5(IV) protein. These data suggest—but do not prove—that the p38 MAPK pathway may be involved in the initiation of increased collagen synthesis in diabetic glomeruli at the transcriptional level early in the course of diabetes but that the subsequent accumulation of collagen may reflect a greater contribution of decreased degradation than increased synthesis. This is consistent with the emerging recognition of p38 MAPK as a regulator of both ECM synthesis and degradation in various cells. For example, with regard to ECM synthesis, p38 MAPK has been implicated in the signaling pathway mediating the synthesis of type 1 collagen by TGF-β in mesangial cells (36). Regarding ECM degradation, p38 MAPK has been shown to mediate matrix metalloproteinase-13 (MMP-13) synthesis as a result of induction by IL-13, TNF-α, and TGF-β1 in chondrocytes, epidermal keratinocytes, and fibroblasts (37–39⇓⇓) and to contribute to the transcriptional regulation of MMP-9 in vascular smooth muscle cells (40). p38 MAPK is also a requisite for MMP-1 induction by IL-1, ceramide, and the tumor promoter okadaic acid (41–44⇓⇓⇓). Inhibition of p38 MAPK in keratinocytes abrogated the increment in MMP-1, MMP-9, and MMP-13 induced by TNF-α or TGF-β (38). However, it should be noted that the ultimate effect of p38 MAPK on MMP seems to be regulated in a highly complex manner and may be determined by the specific upstream molecules that are involved in its activation (41). For instance, in fibroblasts, activation of p38α via MKK3 inhibits MMP-1 promoter activation through a complex mechanism involving inactivation of MEK1,2 by phosphatases (41). Taken together, one may speculate that the noted early increase in phospho-p38 MAPK observed in diabetic glomeruli may contribute to ECM synthesis by transcriptional regulation increasing the expression of the collagen α5(IV) gene, while the late decline in phospho-p38 MAPK may enhance matrix accretion via a decrement in the elaboration of matrix metalloproteinases. To conclude, in diabetic glomeruli in vivo and in podocytes cultured in HG, 12-LO, p38 MAPK, and collagen α5(IV), mRNA and protein levels are stimulated. However, in glomeruli, increments in activated glomerular phospho-p38 MAPK protein and collagen α5(IV) mRNA are transient. Inhibition of glucose-induced podocyte 12-LO activation by the 12-LO inhibitor CDC resulted in a decrement in phospho-p38 MAPK and collagen α5(IV) mRNA and protein. Taken together, the data suggest that activation of the 12-LO and p38 MAPK signaling pathways in podocytes contributes to the genesis of diabetic nephropathy by mediating some of the characteristic changes in ECM synthesis and turnover observed in this disease process. This work was supported by grants from the Juvenile Diabetes Research Foundation (S.G.A. and R.N.) and the National Institutes of Health grants RO1-DK58191 (R.N.) and RO1-DK57676 (C.K.). We thank Linda Lanting for technical assistance and James Hargrove for immunohistochemical staining. Are Podocytes Passive or Provocative in Proteinuric Glomerular Pathology?